An odd issue lately. I lose internet connectivity. Sometimes the hub shows all the blue lights still on, and sometimes it shows amber for 'broadband'....but whatever, it makes no attempt to reconnect. I have to switch the router off and on to get it to reconnect...which never used to be the case as it used to do so automatically. Also, when the Broadband light is amber, if I press the 'reset' button on the hub nothing happens. 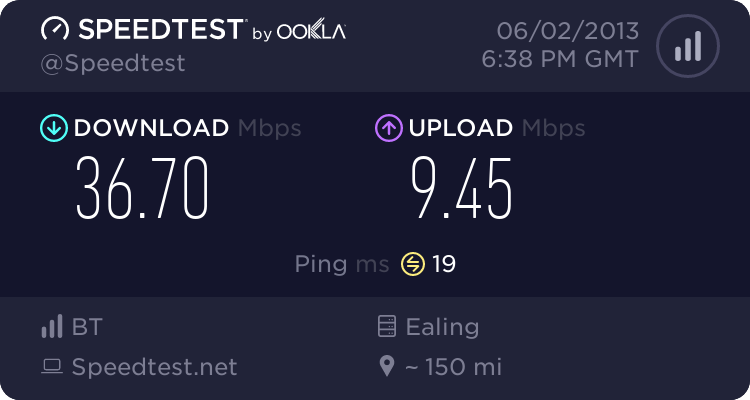 Ring up and moan, they have to give you another if they think it is wrong, how other internet providers I have had work so guess the same, dad not a nice new router from talk talk when moaning internet was not good and the lights on the router not normal. try, you can only ask. If you go into my BT ( log in) and then my broadband, then BT HH4 ( down the side) you can buy a nice new hub only out to buy 2 days ago. Don't know why yours does it's funny things and sure someone can get it sorted, if not moan to BT. Now waiting for my new one to arrived Wednesday, we shall see. if it comes tomorrow then very impressed I will be!. hope you get it sorted, never had a problem with mine the 2 years I have had, just going for the new one for £35 as good price and not in the mood for renew contract so get a free one, nothing is free in this world when it comes to companies.